Some web forums permit users to put signatures or comments on posts made by them. As you might know, getting links from related forums is an important SEO strategy that will benefit your site in a long term. 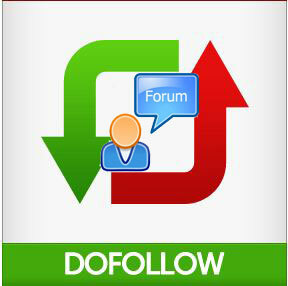 A dofollow forum is a community that allows dofollow links in the signature space. Search engines will not crawl nofollow links-so while participating in a forum for basic search engine promotion always check whether it’s a nofollow or dofollow. 1. Signature links from these dofollow forums will be counted as your backlinks. So each link will boost to your search engine rankings. 2. Visitors from forums are usually found browsing more pages than a normal visitor from a search engine. 3. Forums are an excellent resource of knowledge. There are many experienced webmasters and like-minded people who share their expertise and help others. While selecting forums for getting links make sure they are active, well moderated and spam free. Quality is always better than quality. 4. Improvement in Alexa ranking: Most of the visitors from webmaster forums will have Alexa toolbar installed in their computer. So participate in forums will also contribute to your website’s Alexa traffic rank. I’ve formulated a list of 130 Dofollow forums allowing signature links in comments. Each of these forums maintains different criteria for displaying signature links. For instance, Digitalpoint forums need the user to complete at least 15 posts and one week of active participation, before they allow a signature link. As of now all these forums have enabled dofollow signature links, but it doesn’t mean that they will remain same in the future. Do you know any other dofollow forum?? Share them in the comment section. Thanks, Its a great list which I have been searching. very helpful post author should be appreciate. Thank for this list! Good! I am looking for a normal little system for the collection of chips for windows, help me, I believe that will not burn just by bulldozer …. thanks for the list buddy, i was searching for this…. Thanks for your great list. I’m going to use it now . Thanks for the forum list, wish it had page rank listed of the forums,or geographical locations. if I could find a high page rank forum in Tampa, it would really be nice. Thanks for the list, I will try them. Ite nice when I come acoss helpful sites like yours. that list gonna be handy..
Forums providing signatures are simply great providing opportunity of getting backlinks. I will love to comment on these..
You have really narrowed my long term search. I hope we will appreciate you more if you can update the list with their PR. hello, thank you so much. This information is awesome! Looks to be a productive list. Shall go through it and give my comments on next followup visit. Hello there thank you very much for this information it is awesome keep on sharing more and more i have book marked this site. I will go to your list of dofollow forums and try to get some backlinks.How do I know if I actually get them?